Take a deep breath – a really deep breath with an exhale that makes you say, “Aah!” Deep breaths and fresh air can do a body good. However, the reality is fresh air is not available for all kids. Nationwide, between 2011 and 2012, the CDC reported that two out of five kids ages three to eleven were regularly exposed to secondhand smoke. In a 2015 survey of Richmond City youth, roughly 26 percent of middle school and high school students reported living in homes where smoking is sometimes or always allowed. Thirty years ago, Surgeon General C. Everett Koop brought to the public’s attention that there is no safe amount of secondhand smoke. Secondhand smoke – the smoke that comes from the lit end of cigarettes and cigars, as well as the smoke exhaled by smokers – kills 40,000 people a year, including 400 babies. There are 7,000 chemicals in tobacco smoke, including hundreds that are toxic and about seventy that can cause cancer. Secondhand smoke can also cause ear infections, more frequent and severe asthma attacks, respiratory symptoms, and contribute to a greater risk for sudden infant death syndrome (SIDS). With the enactment in 2016 of the Virginia law that prohibits smoking in a motor vehicle while a minor under the age of eight is present, anyone who smokes in a car should be reminded that this air pollution can be ten times higher than the worst outdoor air pollution. And don’t think rolling down windows gets rid of secondhand smoke. It doesn’t. For healthy living, Virginians are encouraged to keep their cars and homes smoke-free at all times, whether or not a child is present. If you have family or friends who use tobacco, respectfully remind them to not smoke in your home, in your car, or around your children. When it comes to public spaces, you may notice more and more places promoting a tobacco-free lifestyle: at your children’s schools, a nearby park, or even your workplace. These are public health efforts to not only protect everyone from secondhand smoke, but to prevent youth from using tobacco. Considering that 22 percent of Virginia high school students reported using tobacco or nicotine products within the past thirty days (according to a 2015 Virginia Youth Survey), there is a good reason to have more locations declared tobacco-free in the future. These tobacco-free zones can also serve as a reminder of something that may be on the healthy living list for a friend or family member: quitting tobacco for good. Research shows that seven out of ten people want to quit, and that over half of people who use tobacco have tried to quit in the last year. If you’re one of those people, the right support can help you achieve your goal. 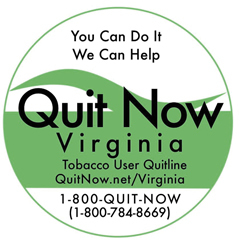 The Virginia Department of Health’s Quitline is a free, confidential tobacco cessation help line that is open twenty-four hours a day and seven days a week for all Virginia residents aged thirteen and older. Call 1-800-QUIT-NOW to talk with a Quit Coach about setting up a quitting plan. Talk to your doctor about nicotine replacement therapies that can increase your chances of quitting for good. Of course, quitting can also help you save money. In case you’ve lost track, in Virginia, a carton of cigarettes costs $45 on average. A pack-a-day smoker can think of it as $1,600 literally going up in smoke every year. Beyond the financial payoff, the health benefits of quitting smoking start right away when you become a non-smoker. Tobacco is a strong addiction, but you are stronger. Next articlePassion, Pain, and What’s for Dinner? Sarah Birckhead, MSW, is the central region coordinator for Tobacco Control with the Virginia Department of Health. Sarah lives in Midlothian with her husband, son, and puppy.